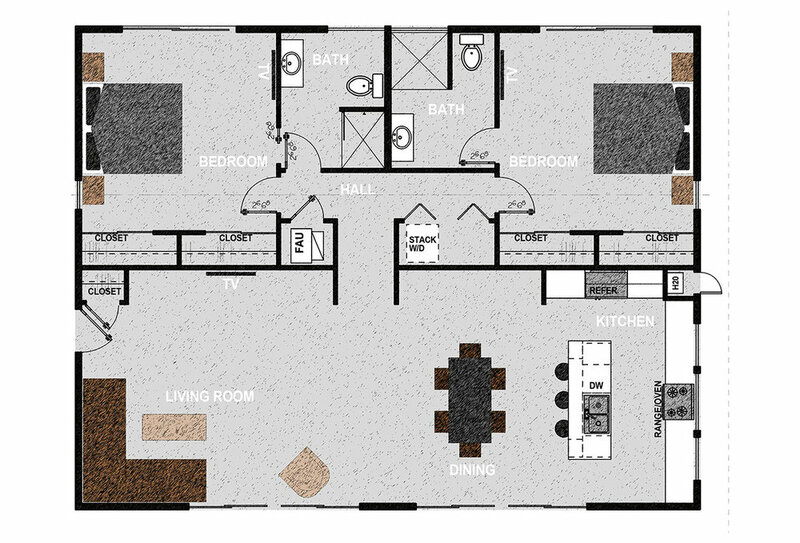 Two bedrooms, two bathrooms, laundry closet, open-plan kitchen, dining, living room in 1,440 square feet. Exterior dimensions are approximately 48’ x 30’. The following items are among those items not included in pricing for the Homestead Modern base model homes. That’s because the cost of these items will vary from property to property and from buyer to buyer. Homestead Modern will provide landowners with a free rough-order-of-magnitude estimate for these items. Landowners simply need to provide HM with the APN (Assessor Parcel Number) or address of their property. A tighter cost estimate can be provided. We charge $85 per hour to generate these estimates. The home consists of two bedrooms, two bathrooms, laundry room and open kitchen, dining room and living room. It offers 1,496 square feet of conditioned living space. Exterior dimensions are approximately 44’ x 34’. The home consists of two bedrooms, two bathrooms, laundry closet, open-plan kitchen, dining, living room in 1,440 square feet. Exterior dimensions are approximately 48’ x 30’. The home consists of two bedrooms, one bathroom, laundry closet and open kitchen, dining room and living room. It offers 1,360 square feet of conditioned living space. Exterior dimensions are approximately 45’ x 34’. The home consists of one bedroom, one bathroom, laundry room and open kitchen, dining room and living room. It offers 770 square feet of conditioned living space. Exterior dimensions are approximately 35’x22'. 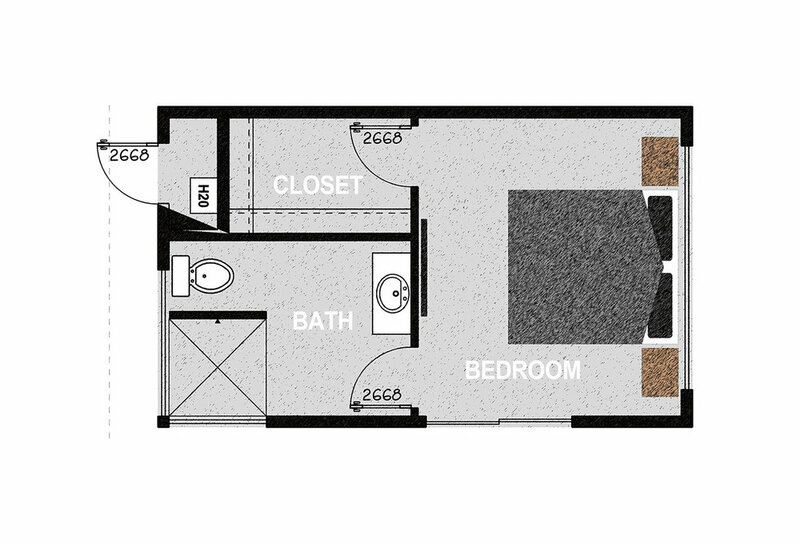 One bedroom and one bathroom with attached carport in 288 sq.ft. of conditioned living space and consists of parking for two vehicles and two ample storage closets. It offers approximately 785 square feet of covered parking on a 510 square foot concrete slab. The home consists of one bedroom, one walk in closet, an exterior mechanical room, and one bathroom. It offers 288 square feet of conditioned living space. Exterior dimensions are approximately 22’ x 13’. 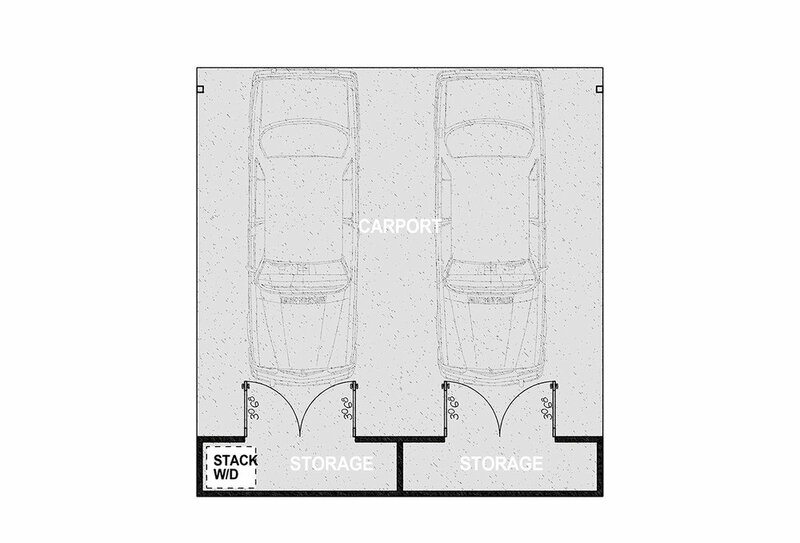 Parking for two vehicles and two ample storage closets. It offers approximately 785 square feet of covered parking on a 510 square foot concrete slab.